When you think of New York City, the first thing comes to mind is all the tourist hot spots; Statue of Liberty, Times Square, Central Park, and the list goes on. While yes these are amazing places to check out and experience to see what makes them so popular, for a certain group of people, what makes New York City a highly coveted destination is the numerous Michelin Star restaurants located on one small island. Did you know that New York City has over 72 Michelin Star restaurants! On my first trip to New York City, I was fortunate to dine at Per Se, a Michelin Two Star restaurant part of Thomas Keller Restaurant Group. 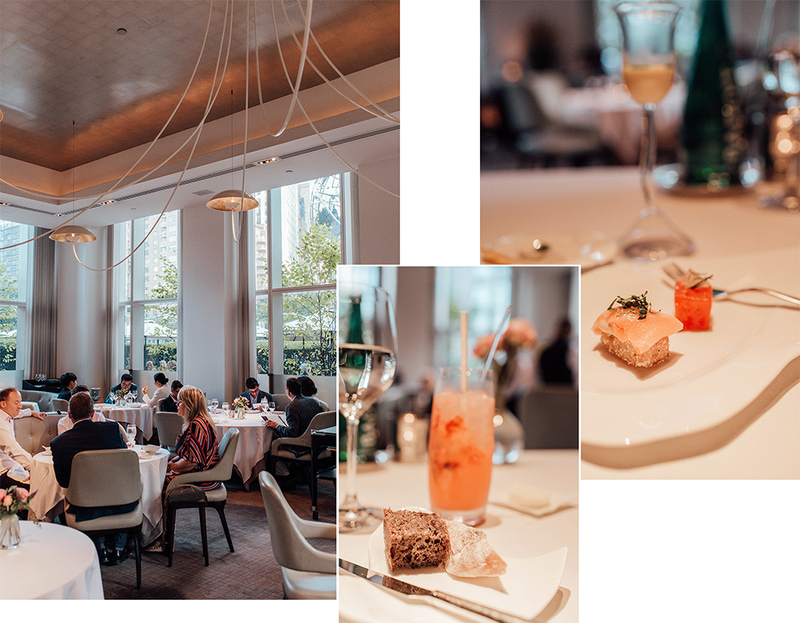 Because my most recent trip was planned in advance, I made sure we dined at four different Michelin Star restaurants during our four night trip to NYC – one for every night. Personal Note: The host will warn you that there is no photography allowed inside the restaurant & to set your cell phone to silent. 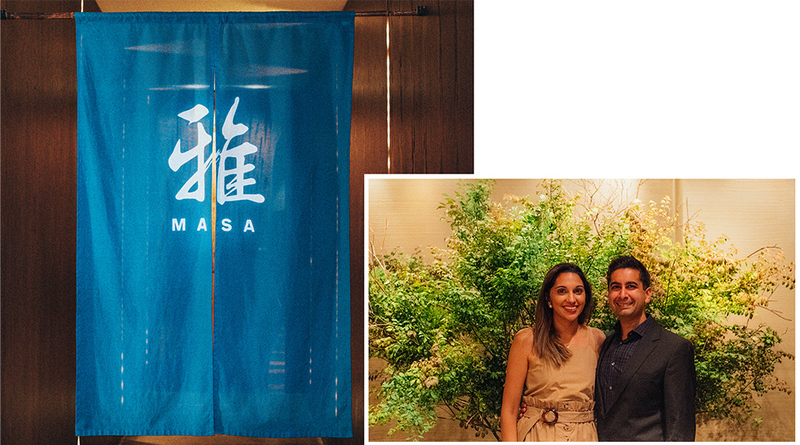 To guarantee a reservation at MASA, you need to reserve as far back as a month in advance. Out of all the restaurants I have had the pleasure to dine at, Masa has the best Omakase menu. 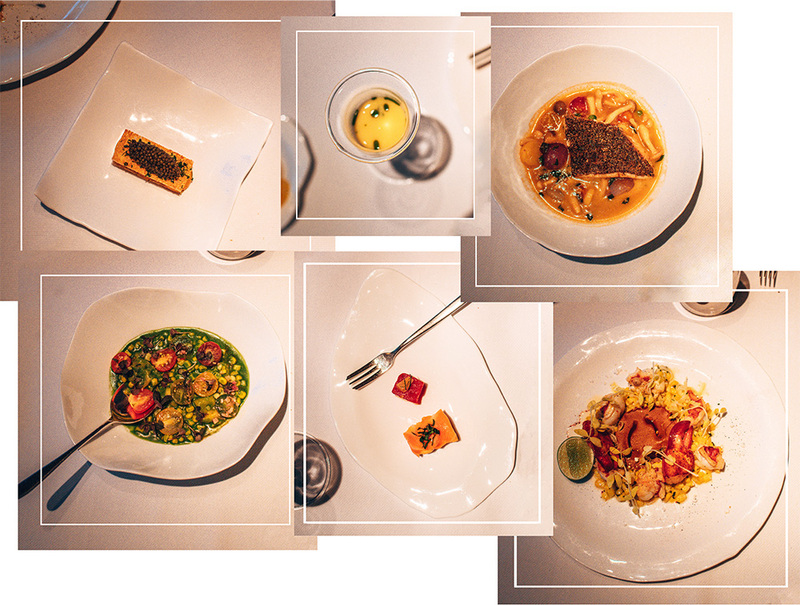 25 courses, completely customizable to your dietary restrictions and they even cater to their vegetarian patrons. When I made the reservations through AMEX Concierge, I was warned that their Omakase menu came at a cost of$595/per person. The first thing I could think of was, is it worth it? Sure, Chef Masayoshi Takayama was a great friend of Anthony Bourdain. Sure, I have had fellow friends rave about their experience dining there. And yes I have also heard how long you have to wait to get a reservation at the sushi bar. But at $595/ per person, how could it be worth it? After dinning there and eating only 23 out of the 25 courses (there was so much I could expand the belt on my dress) I can confidently say yes. As a girl from the west coast who loves sushi, I can be extremely particular about it. I enjoyed every piece that was served to me for the 2.5 hours we were at Masa. My favorite was Toro Caviar. The Toro Caviar is his signature dish and it is divine! You get this in your second course to help you mentally prepare for what’s to come. I fell in love with the rich flavor of the toro combined with the salty brine flavor of the Osetra caviar. You get a delicious flavor in your mouth that’s soft, buttery and salty at the same time. If you ever dine at Masa, make sure you take your time eating this and savor the flavor, it’s that good! I didn’t do this the first time, so I traded one of my courses for it- so worth it! Personal Note: To guarantee a reservation at Jean Georges, you need to reserve as far back as three weeks in advance for lunch, one month for dinner. 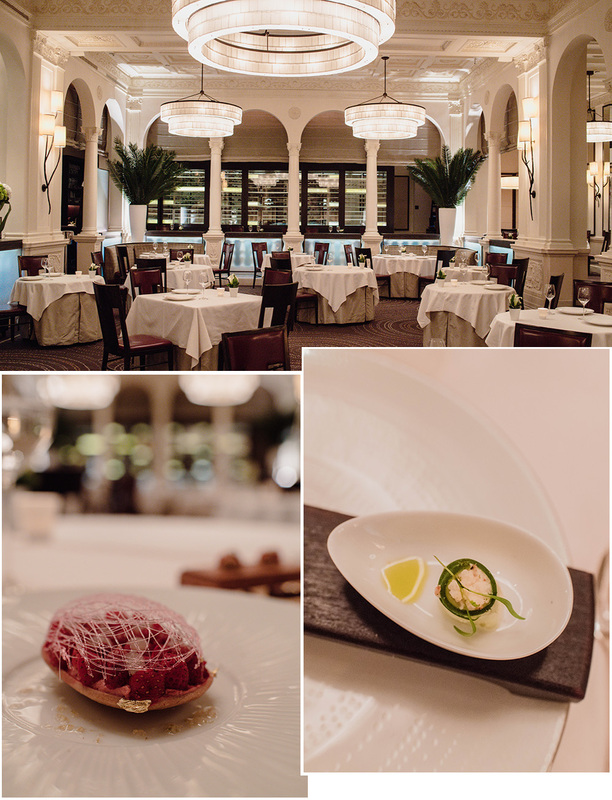 Jean Georges is the jewel of Chef Jean Georges Vongerichten offering the very best in fine dining. I came to Jean Georges because I heard amazing things about his famous dish, Egg Caviar. Sadly I couldn’t have this dish because his secret ingredient is Vodka (I don’t drink), but don’t worry – there are so many dishes I ordered from his menu that more than made up for it. After trying virtually everything on the menu that accommodates my pescatarian diet, Jean Georges did not disappoint. You know the chef is amazing when he gets you to eat more than 4 spoons of a dish containing papaya (my least favorite fruit). Not only that, I walked away feeling like I needed to pay better attention to parsnips, he kept using it in puree for two of his dishes and I loved it! Everything we ate was daring, shockingly different than what I expected and incredible. I can’t wait to go back to NYC and see how much his menu has changed to accommodate what’s available in season. Living in Toronto, I have had the pleasure to dine at Daniel Boulud’s French Brasserie – Cafe Boulud, multiple times. Everything they serve at Cafe Boulud has been amazing and only whetted my appetite for what I could expect from Daniel’s pride and joy located on 65th street a Park Avenue. 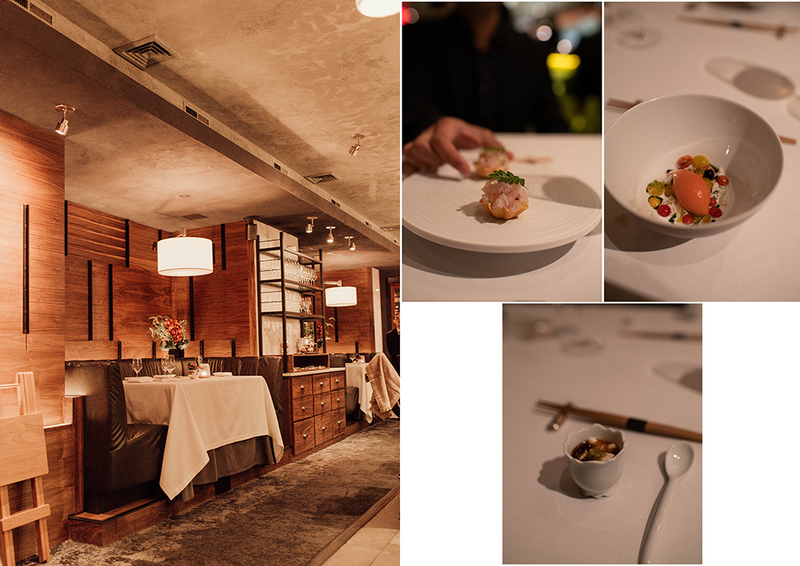 Plus seeing an episode of BILLIONS where Bobby Axelrod had a private dinner at Daniel and was greeted personally by Chef Daniel Boulud, come on – I had to make sure we got a reservation and we did. We took the last reservation for the evening. If there was a restaurant that inspired me to want to learn how to upgrade my culinary skills, Daniel would be it. Every item that was served to us was sheer nirvana. 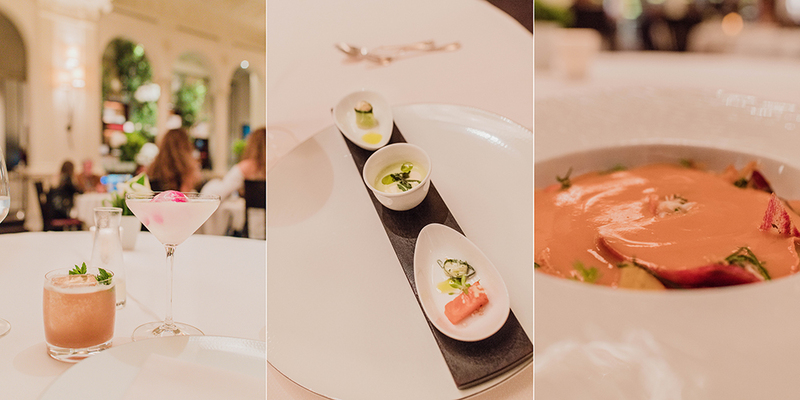 The light cucumber soup, chilled carrot veloute with Peekytoe crab, Scottish Langoustine Salad and fruit exotique – each of these dishes were amazing. The food was inventive and adventurous and the drinks (mocktails) were delightful and perfect. For someone who drinks a lot of mocktails, it was a treat to not be given a virgin mojito. Instead, we got a lychee drink with an ice cube infused with rose petals. Out of all the reservations I made for my trip to NYC, this was one I was praying hard to get. Chef’s Table at Brooklyn Fare, or commonly known as Brooklyn Fare, is located within its namesake market. This trendy French-Japanese counter spot can be found at the back of the market (right pass the cured meats, prepared salads, and cheese) where the hosts will whisk you away to its hidden gem. 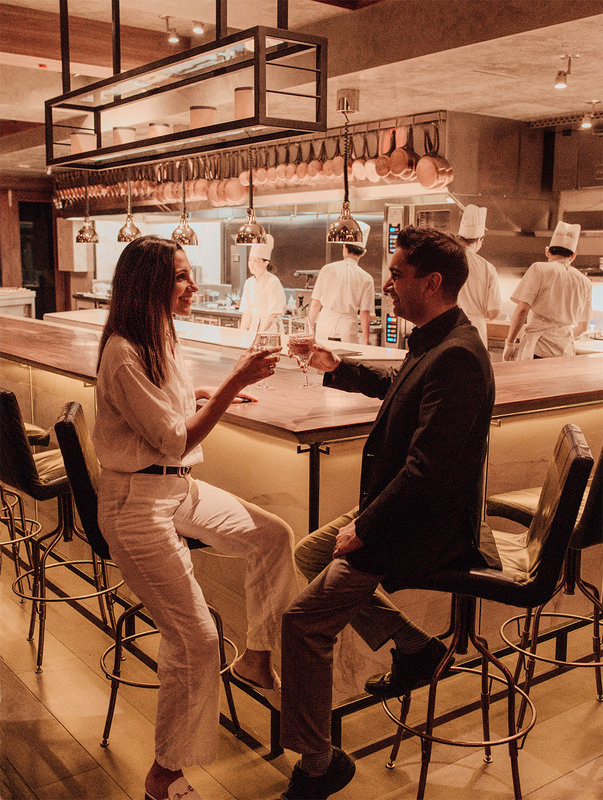 A private, dark and intimate room with a u-shaped counter that hugs the kitchen so you can see Chef Cesar Ramirez and his team create, plate and present your meal. We sat at our booth for two and a half hours and were wowed by Chef Ramirez’s culinary skills. Everything served to us was inventive and delicious. I can see why this little gem was awarded its first Michelin ever (two stars) from Jean-Luc Naret, Directeur General of the Michelin Guide. Every item we were served was unique, different and somehow Chef Ramirez exceeded our expectations on how amazing the next item would be. The bluefin tuna belly would be accompanied by classical luxuries like truffle and caviar in just the right proportion so it would compliment each element making up that course. Each course could be consumed in 2-3 bites but the flavor would linger a while in your mouth. Brooklyn Fare is the first restaurant to introduce me to white truffle, and I have to admit it’s my new favorite because it is incredibly light in flavor with a mild garlic trace. If you are a teetotaller like myself, make sure you let the staff know in advance so they have non-alcoholic pairing to help enhance and enjoy your meal. I was surprised with the selection they offered plus the fact that everything was made in house. The only time I have ever been blown away by a restaurant that offered non-alcoholic pairing was in Berlin. Such pretty pictures! Food looks so pretty! Hope you had a great time! Definitely Worth trying. Thanks for sharing. Looks so fancy and delicious! NY really has some of the best restos in the world. This is amazing dear, I gotta try this. Thanks for sharing!